A photo from a family in Montana, Lizzie on her Pootie Pad. The Peace Pad has lavender added to the catnip for extra stress relief. The seasons are changing and Ann (winglion) has designed a new catnip toy. The Daily Kos communty voted to call them Purrmuda Triangles. We are offering as a bonus with every $35 purchase of Pootie Pads one toy. If you buy $70 worth, you will get two! Or buy four toys for $35 and get five. Links to buy Pootie Pads are below the fold…. Pootie Pads are a product that arose because of the daily Pootie diaries here on Daily Kos — they were designed with the cats of Kossacks in mind. Made with love by myself and my sister, winglion, they are little quilts filled with human grade, organic catnip (the best we have ever found) from Oregon. All the fabrics are pre-washed before we use them so the pads are innocent of any toxic sizing or preservatives. Cats love them! The pads promote play — and also seem to have a soothing effect on anxious cats (making them the perfect liner for a cat carrier during travel). 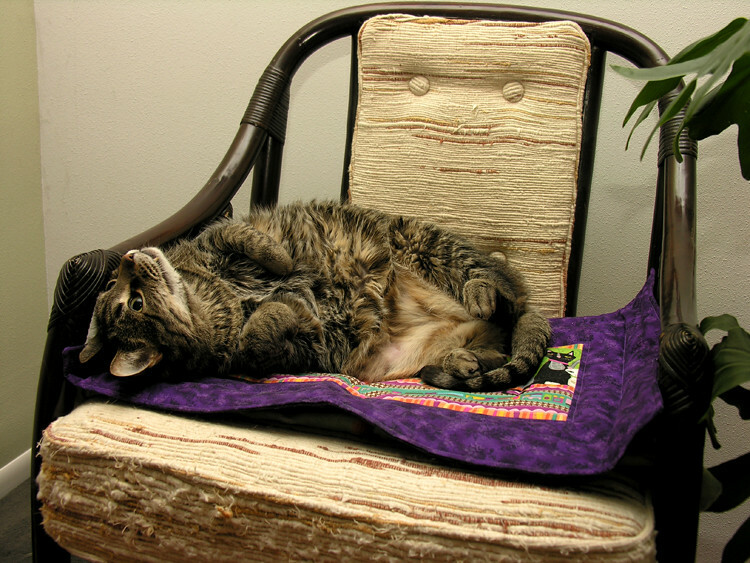 Elderly cats love them, too — we think because the catnip eases the aches and pains of older bones and joints. Our pads for dogs contain organic lavender and thyme, soothing herbs that may promote calm. Pootie Pad party at a Cat Cafe! Pootie Pads for cats come in three sizes. Fabric choices for original and petite sizes are here - or let us choose for you. For that Mid Century Modern look…. Does catnip open doors to other dimensions? The cats aren’t telling...but we can guess! If you have photos of your pets with Pootie Pad products that we may use on our website, please post them in the comments! We haven’t forgotten the dogs! Our soothing lavender & thyme pads for dogs can be found at this link. Fabric choices for the petite and medium pads are there, too! The large size pads for dogs (as shown below) are made from a double layer of batting and flannel fabric (color may vary). We also have lavender filled pads for people. The Little One kindly filmed her cat, Suki, on a Pootie Pad. This is what happens when you open the package! This content was created by a Daily Kos Community member. Make your voice heard! Click here to write or comment on Daily Kos. Lizzie's sister, Flower, has her own Pootie Pad -- no problems with sharing!